Love at first sight is true when you come to SAI PALACE and see the TAJ MAHAL from our roof top lounge & Restaurant, best place to meet fellow travelers. Sai Palace is located in front of Taj Mahal between south & east gate, just( 200 Mts) 2 minutes walk to any gate. 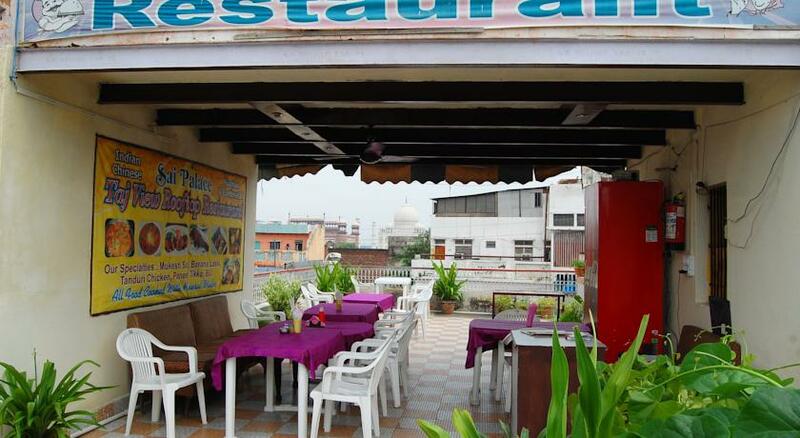 Ideal place and location for travelers ,close to Red Fort, Rly Station and city centre. Backup Generator, Breakfast Services, Doctor on Call, Travel Counter, Room Service, Airport Transportation, Currency Exchange, Parking, Laundry Facilities, Security Guard. DVD Player, House Keeping, Attached Bathroom, H/C Water, Iron/Ironing Board, Cable/Satellite TV, Air Conditioning Room, Wakeup Calls, Toothbrush/Razor on Request. User reviews for "Sai Palace Hotel Agra"